Editor in Chief® Beginning 1 improves students' grammar, punctuation, spelling, capitalization, and attention to detail using a standards-based thinking approach rather than drill and practice. 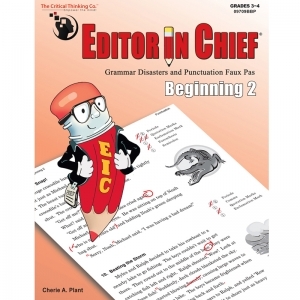 This effective method teaches students to carefully analyze and edit stories. 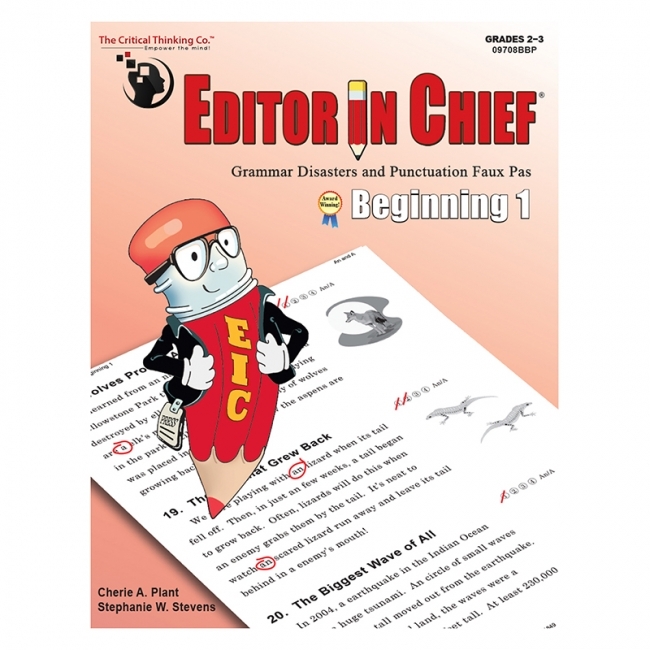 This book includes 16 lessons in grammar and mechanics. 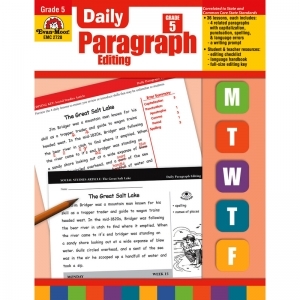 Students identify and circle errors in each story and write their correction. The grammatical and mechanical errors in the paragraphs are based on general instructional guidelines for specific grade levels; the content level, however, is ungraded, allowing usage of these materials at many instructional levels. 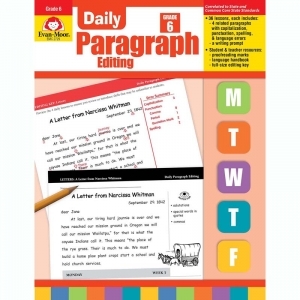 Writing styles and content are varied to sustain interest and to broaden the students' exposure to different writing formats, such as letters, stories, and dialogue. The illustrations integrated into the context of the activities further spark student interest. The skills developed can be applied to the students' own writing. Detailed answers are also included. 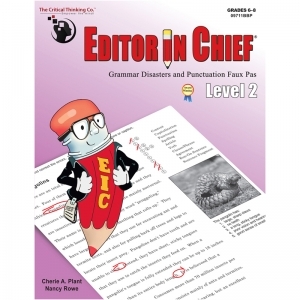 Editor in Chief® Beginning 2 improves students' grammar, punctuation, spelling, capitalization, and attention to detail using a standards-based thinking approach rather than drill and practice. 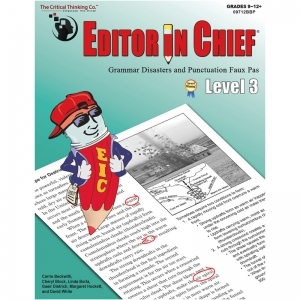 This effective method teaches students to carefully analyze and edit stories. This book includes 18 lessons in grammar and mechanics. Students identify and circle errors in each story and write their correction. 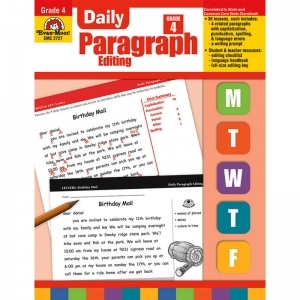 The grammatical and mechanical errors in the paragraphs are based on general instructional guidelines for specific grade levels; the content level, however, is ungraded, allowing usage of these materials at many instructional levels. 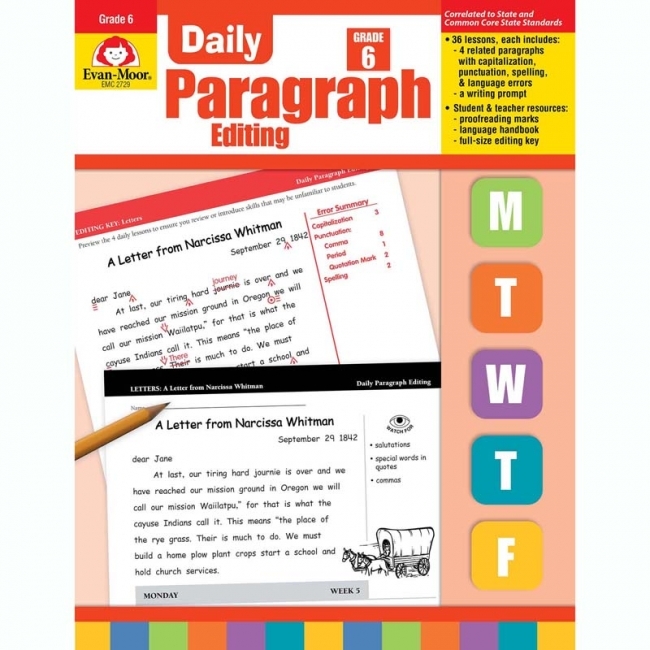 Writing styles and content are varied to sustain interest and to broaden the students' exposure to different writing formats, such as letters, stories, and dialogue. The illustrations integrated into the context of the activities further spark student interest. 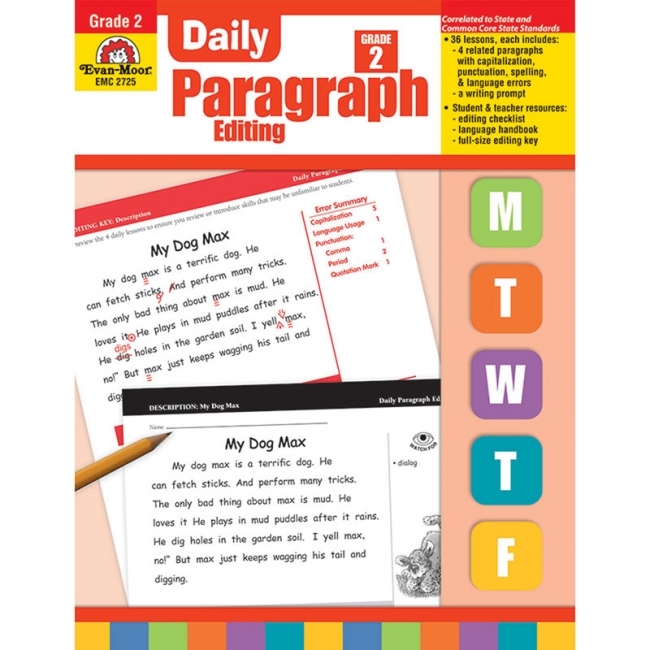 The skills developed can be applied to the students' own writing. Detailed answers are also included. 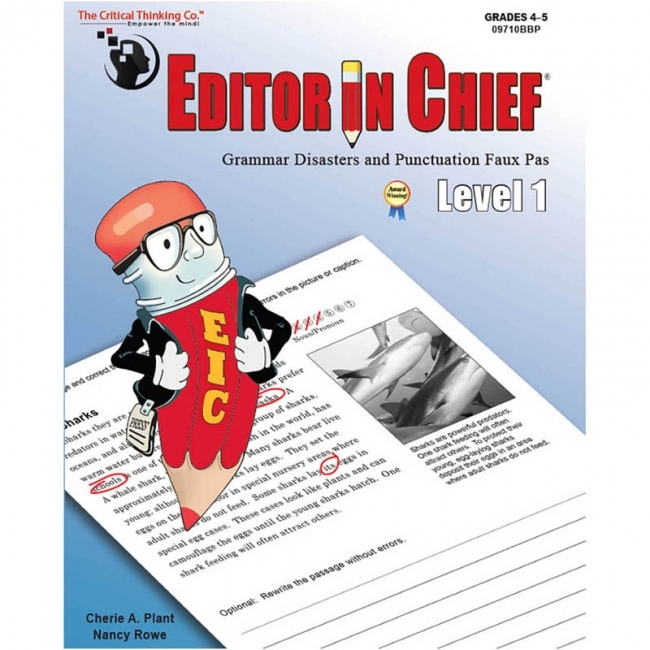 The Editor in Chief® Level 1 book includes 12 easy-to-understand lessons in grammar and mechanics and 69 activity pages. The lessons include the following: content, capitalization, punctuation, spelling rules, nouns, pronouns, adjectives, adverbs, articles, verbs, agreement, conjunctions, prepositions, interjections, confusing word pairs, negative words, homophones, homographs, run-on sentences, and sentence fragments. After learning a lesson, students apply the rules by correcting the errors, and reviews provide more challenging practice of the multiple skills already taught. Detailed answers are also included. The Editor in Chief® Level 2 book includes 12 easy-to-understand lessons in grammar and mechanics and 69 activity pages. 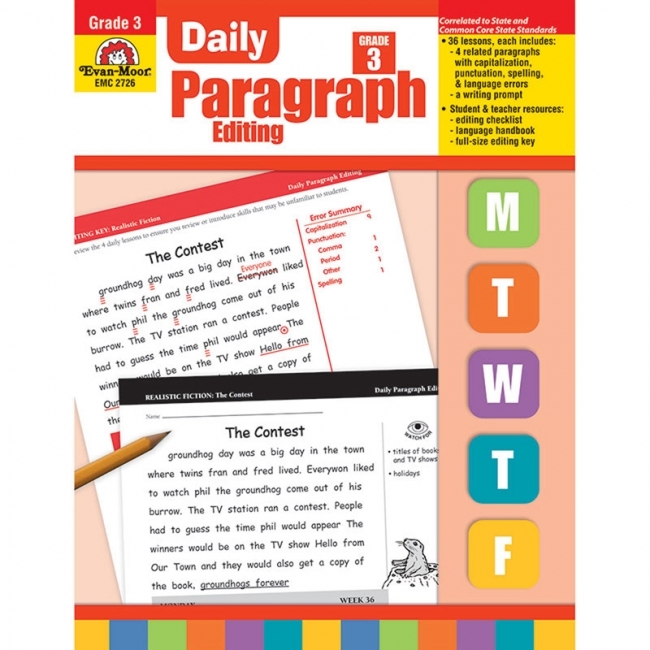 The lessons include the following: content, capitalization, punctuation, spelling, adjectives, adverbs, articles, conjunctions, prepositions, interjections, pronouns, verbs, clauses, phases, agreement, confused word pairs, negative words, run-on sentences, and sentence fragments. After learning a lesson, students apply the rules by correcting the errors, and reviews provide more challenging practice of the multiple skills already taught. Detailed answers are also included. Editor in Chief® Level 3 improves students' grammar, punctuation, spelling, capitalization, and attention to detail using a standards-based thinking approach rather than drill and practice. 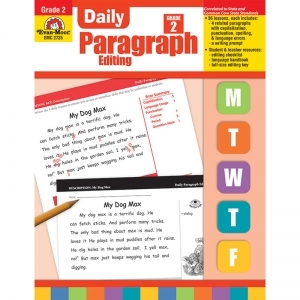 This effective method teaches students to carefully analyze and edit stories that contain errors in writing mechanics and story details. Daily Paragraph Editing, grade 7 reproducible teacher's edition contains everything you need to lead targeted language lessons, including 176 reproducible student activity pages and corresponding teacher support. Daily Paragraph Editing grade 7 provides 36 weeks of frequent, focused language practice to help your seventh graders learn the conventions of standard English grammar and usage. The concise daily activities are ideal "warm-up" exercises to begin your language arts block and are adaptable for small-group and whole-class instruction. 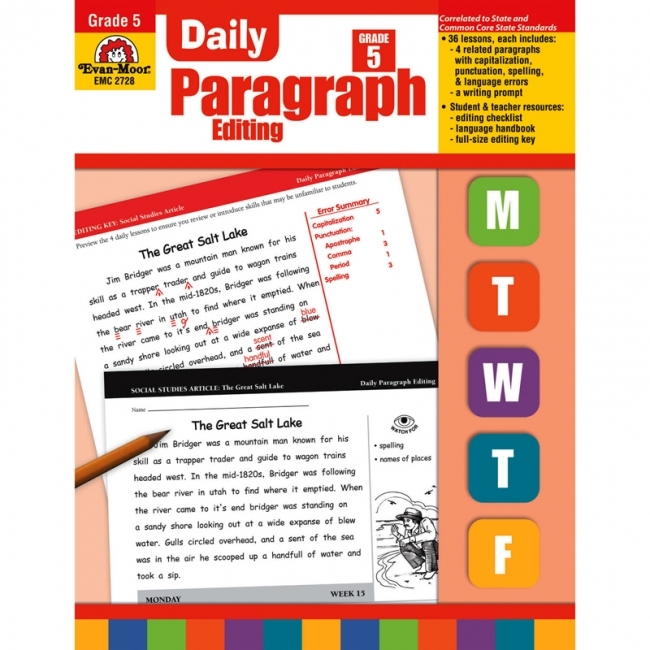 How it works: students apply grade-level language skills to correct a paragraph on Monday through Thursday; when read together, the four paragraphs form a cohesive composition. 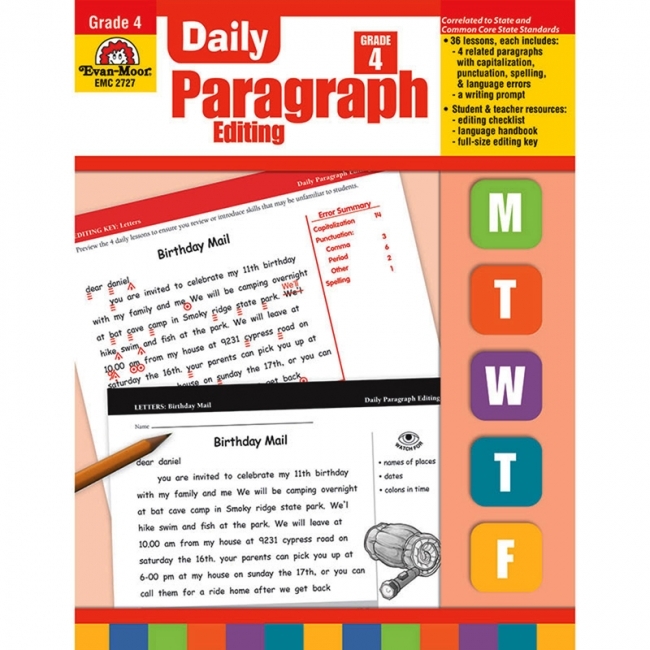 A writing prompt on Friday relates to the week's four-paragraph composition and gives students the chance to apply the targeted language conventions. 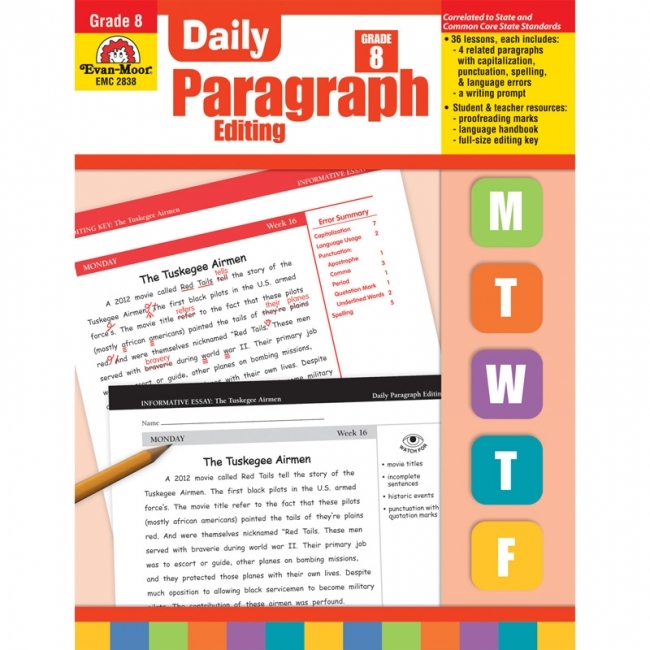 Daily Paragraph Editing, grade 8 reproducible teacher's edition contains everything you need to lead targeted language lessons, including 176 reproducible student activity pages and corresponding teacher support. Daily Paragraph Editing grade 8 provides 36 weeks of frequent, focused language practice to help your eighth graders learn the conventions of standard English grammar and usage. The concise daily activities are ideal "warm-up" exercises to begin your language arts block and are adaptable for small-group and whole-class instruction.